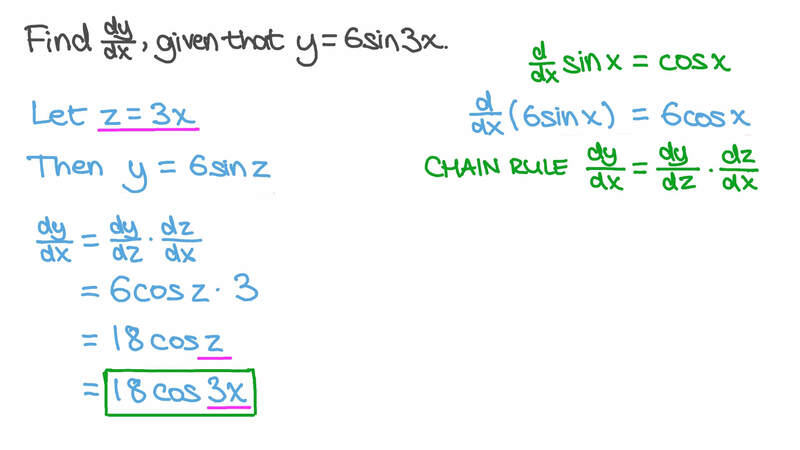 In this lesson, we will learn how to find the derivatives of trigonometric functions and how to apply the differentiation rules on them. Find d d 𝑦 𝑥 , given that 𝑦 = 6 3 𝑥 s i n .
If 𝑦 = 7 2 𝑥 t a n , find d d 𝑦 𝑥 . Given that 𝑦 = 1 0 𝑥 − 2 9 𝑥 c o s , determine d d 𝑦 𝑥 . If 𝑦 = 2 ( 3 + 8 𝑥 ) s i n , determine d d 𝑦 𝑥 . Given 𝑦 = 4 𝑥 4 𝑥 s i n t a n , find d d 𝑦 𝑥 at 𝑥 = 𝜋 6 . If 𝑦 = 6 4 𝑥 + 2 2 𝑥 c o s s i n , find d d 𝑦 𝑥 . If 𝑦 = ( 8 𝑥 − 4 ) s i n 2 , find d d 𝑦 𝑥 . If 𝑦 = 6  6 𝑥 − 1 1  t a n 2 , find d d 𝑦 𝑥 . If 𝑦 = ( 4 𝑥 − 8 ) + ( 8 𝑥 + 6 ) s i n c o s , find d d 𝑦 𝑥 . If 𝑦 = 5 2 𝑥 c o s 3 , find d d 𝑦 𝑥 . If 𝑦 = 𝑥 5 𝑥 5 s i n , determine d d 𝑦 𝑥 . If 𝑦 = 7 𝑥 ( 5 𝑥 + 4 ) s i n , find d d 𝑦 𝑥 . If 𝑦 = 𝑥 1 − 𝑥 s i n c o s , which of the following is the same as 𝑦 ′ ? If 𝑦 = 7 𝑥 9 𝑥 t a n , find d d 𝑦 𝑥 . If 𝑦 = 9 𝑥 5 + 5 𝑥 s i n c o s 2 , find d d 𝑦 𝑥 . If 𝑦 = 6 𝑥 1 − 6 𝑥 c o s s i n , find d d 𝑦 𝑥 . If 𝑦 = ( 1 2 5 𝑥 ) c o s c o s , find d d 𝑦 𝑥 . If 𝑦 = 1 5 8 𝑥 − 1 5 8 𝑥 s i n c o s 2 2 , find d d 𝑦 𝑥 . Given that 𝑦 = ( − 2 𝑥 − 7 ) ( 8 𝑥 + 1 9 ) c o s s i n , determine d d 𝑦 𝑥 at 𝑥 = 𝜋 . Given that 𝑦 = 5 𝑥 +   1 − 5 𝑥   t a n t a n t a n t a n 𝜋 7 𝜋 7 , determine d d 𝑦 𝑥 . 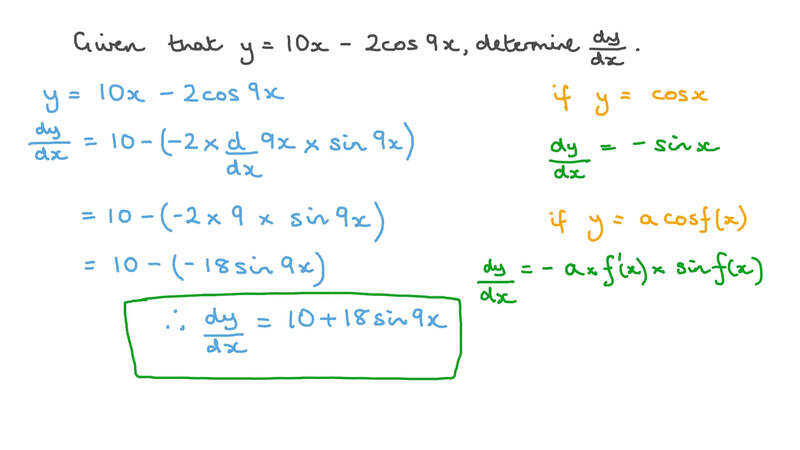 Find the first derivative of the function 𝑦 = − 6 𝑥 c o t 8 . 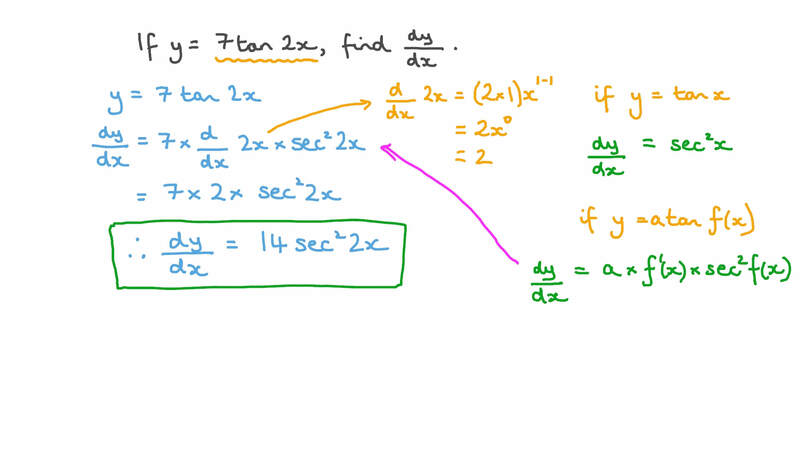 Find the first derivative of the function 𝑦 = − 2 ( 9 𝑥 − 4 ) ( 9 𝑥 − 4 ) s i n c o s .
If 𝑦 =   2 + 4 𝑥  3 t a n 7 8 , find d d 𝑦 𝑥 . If 𝑦 = 3 ( 8 𝑥 − 3 ) c o s , find d d 𝑦 𝑥 . If 𝑦 = ( 2 7 𝑥 + 2 7 𝑥 ) s i n c o s 2 , find d d 𝑦 𝑥 .